After completing my studies, I spent the summer in Utila, Honduras, where I completed my certification as a PADI Divemaster, with specialities including enriched air, wreck, deep and night diving. The dive school worked in conjunction with a marine research base, so in addition to leading fun dives and assisting on Open Water courses, I aided undergraduate, masters, PhD students, and scientists undertaking research on the coral reefs there. The following spring, I spent three months in the Philippines with Large Marine Vertebrates Project Philippines (LAMAVE) researching the impacts of humans feeding whale sharks. There, I acquired knowledge of whale shark biology, photo ID techniques, tagging, and the importance of citizen science. This has led me back to the Philippines, again working with LAMAVE on a hammerhead shark fishery and nursery assessment. For this, I have fundraised, helped set up and am currently leading the project. Each whale shark has a unique spot pattern similar to a fingerprint. Every day I was freediving with them, taking in-water photographs and comparing the photos to a database of previously identified whale sharks. So for me, the most exciting thing was to discover a new individual not previously seen before in the Philippines. I would not worry as much about my next step. After my exams, and leading up to that period, I was anxious and restless, concerned that I had no concrete plans for the immediate future. So, on reflection, I would stress less about the unknown. Whilst I studied hard, I was slightly prone to procrastinating. I would tell myself to knuckle down and focus on the work in front of me, leaving more time to get out and about, to explore and enjoy Plymouth and the surrounding areas. Also exercise more, as this aids productivity and relieves stress. Finally, I would tell myself to make the most of my time at university; take any opportunity that arises, whether that is volunteering or getting involved in a sports club or society. There were a variety of reasons why I chose Plymouth, the main one being the optional HSE Commercial Scuba qualification undertaken alongside the degree. This gave me invaluable experience and knowledge, with a significant focus on safety, which I applied to my training and work as a scuba diver. The residential field course to Malaysia also played a major part in my choice. We proposed and carried out scientific research in the rainforests of Malaysia. There, we were able to apply fieldwork techniques learnt in a classroom. The interdisciplinary approach to my course appealed to me as well, covering topics from environmental law to sustainable food systems, marine protected areas to ecological economics. Finally, the location of the University was perfect, with Dartmoor National Park, Plymouth Sound, the Barbican, and the Hoe all a short distance away. I found PALS extremely helpful in my first year; it enabled me to learn and understand ways in which to carry out the coursework to the best of my ability, and to discuss various topics with second year students who had first-hand knowledge. I used the library and LABplus throughout my degree, and utilised the optional GIS appointments in LABplus. Studying at Plymouth reinforced my decision to follow a career in environmental science by obtaining knowledge and experience in a broad range of topics. I wouldn’t say it changed my career aspirations, rather it highlighted my enjoyment for fieldwork and motivated me to make a difference wherever possible. Undertaking a marine module each year and carrying out research for my dissertation in Indonesia confirmed that my true passions lie in marine conservation and biology. I think it is almost impossible to choose just one memory. I gained some amazing friends and had some incredible experiences, but I would have to say the thing that stands out in my mind is the residential field trip to Malaysia. From sightseeing in Kuala Lumpur, jungle trekking and field research with my lecturers, to scuba-diving on some of the most amazing coral reefs. My course gave me a wide skillset and understanding, and has prepared me to apply these in a real life situation. I always felt able to ask for guidance when needed and my lecturers were integral to my development, which has helped me to become a more independent and confident individual. The University is situated in a beautiful part of the country, with a relaxed and friendly atmosphere – perfect for course field trips. During my years living and studying in Plymouth, I felt completely at home and have made some lifelong friends. I truly believe the three years of my undergraduate degree will come to be some of the best years of my life. I undertook a six week summer placement as part of my dissertation research on the remote island of Hoga, Indonesia, with Operation Wallacea. I studied the crown-of-thorns starfish and the effect their feeding has on the surrounding coral reefs. 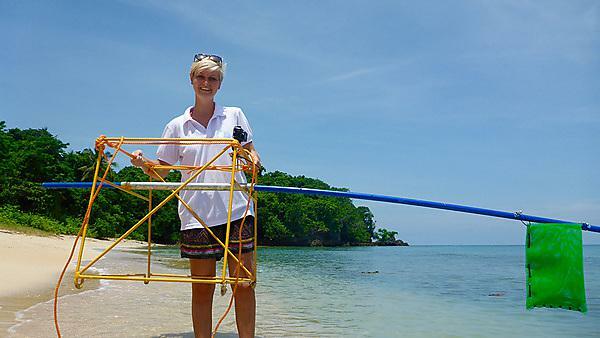 This involved snorkelling and freediving daily to collect feeding preference and morphometric data. My placement reinforced my desire to be out in the field, researching and working towards the conservation and protection of the marine environment and its inhabitants. My long-term plans are now to continue this work with specific focus on sharks, rays, turtles, and marine mammals.